Our buddies over at HoZac just put out a killer debut 7″ for some real Oakland bebes, Wax Idols. We’re not positive, but we think that might be a Splinter in there. They’re also fronted by Miss Hether Fortune, who you might recognize as Heather Fedewa – a former Bare Wire and one of Hunx’s punx. Anyways, the three girls and one guy have been playing out in the bay area of California for a bit and finally have some wax under their belt. They self-released a cassette a little earlier this year, but since it was limited to only 100 copies we’re pretty sure that you won’t be able to get your hands on one. Actually, looks like Psychic Snerts released it and they might still have a couple to cop [thanks for the tip, Hether] We’ve got a feeling that the 7″ will go pretty fast too, so jump on it. You can check out a video for the single below. 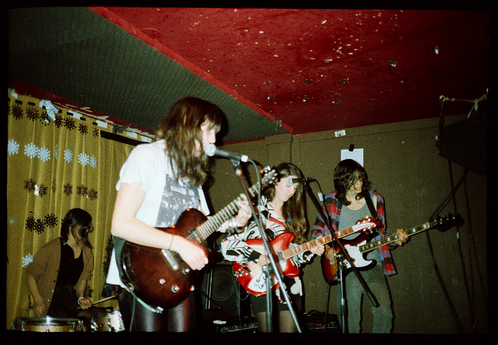 It’s like Wire meets riot grrrl meets meat meets…. whatever. Just to be clear, the All Too Human video was produced, directed, filmed, and edited by Hayden Shiebler. Co-produced by Hether Fortune. Projections and visuals are by Meryl Olah and Mark Treise. My online magazine Betty premiered the video, but I did not make it.